The global smartphone market is highly dynamic. Although smartphones did not exist 20 years ago, it was estimated that the number of smartphone users worldwide has reached more than two billion in 2016. In terms of shipments, China has remained the world’s largest smartphone market since 2012. In 2016, smartphone shipments in China reached over 467 million units, accounting for about 31.8 percent of the total volume of global smartphone shipments. The number of mobile phone users in China is projected to reach about 1.1 billion by 2019 with as many as 63 percent of them smartphone owners. The mobile phone service in China is provided by three domestic telecommunication network operators: China Mobile, China Unicom and China Telecom. By the end of 2016, the sales value of smartphones in China had amounted to about 133.6 billion dollars, with an increase of about 15 percent compared to the previous year. The large smartphone market in China also led to fierce competition among various manufacturers. 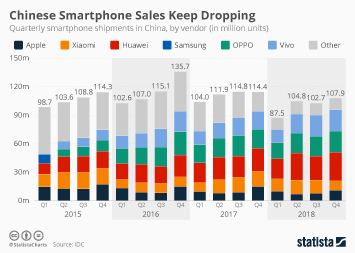 Apple and Samsung are facing more and more challenges and pressure from domestic smartphone makers in China like Huawei, Oppo, Vivo and Xiaomi. In the fourth quarter of 2016, the shipment volume of iPhone picked up to approximately 14.9 million units after the launch of its iPhone 7 model series, while the Chinese domestic brand OPPO ranked first with a shipment volume of about 24.5 million units. The Chinese companies have long left the cheap segment and are producing more and more high-end smartphones with considerable success. They are benefiting from a rich local smartphone manufacturing and design ecosystem, which allows them to compete with foreign smartphone brands. In terms of operating system market share, the Chinese market was dominated by Google’s Android OS and Apple’s iOS. The two systems occupied about 99 percent of the market by the end of 2016, while the market share of SymbianOS had dropped from 39 percent at the beginning of 2012 to only 0.01 percent by the end of 2016. The outstanding development of the smartphone market in China is closely associated with the increasing popularity of mobile smartphone useage in the country. The majority of China’s internet users use a smartphone as their primary means of going online. According to a survey on internet use, the average daily time spent with non-voice mobile activities by adults in China had reached 98 minutes. More and more people could not live without their smartphones. When asked about the activities on their smartphones, about 33 percent of smartphone users stated that they watched online videos on their smartphones at least once a week.